Maui Arts League sponsors, volunteers and advisers are planning their largest Maui Plein Air Painting Invitational yet, scheduled for Feb. 16-24, 2019. 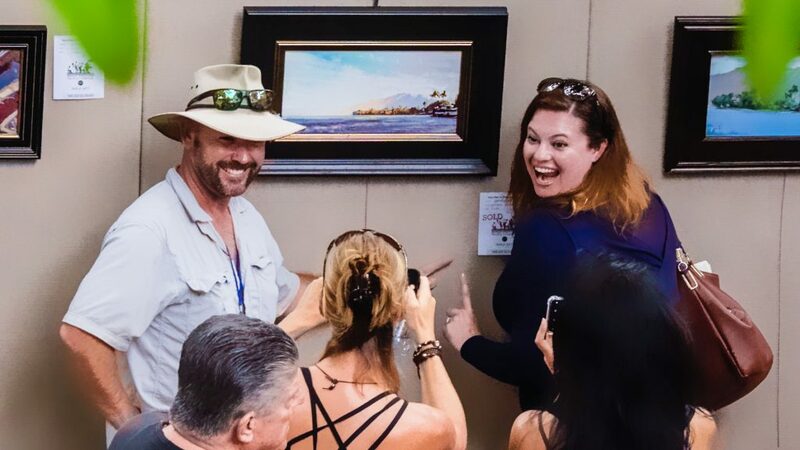 “Maui Arts League and our partners aim to give our entire community a beautiful art experience, watching award-winning landscape artists interpret and express the beauty of our island and learning about fine art. We want our talented, creative children to consider fine art as a profession,” said Lois Reiswig, Maui Arts League nonprofit president. 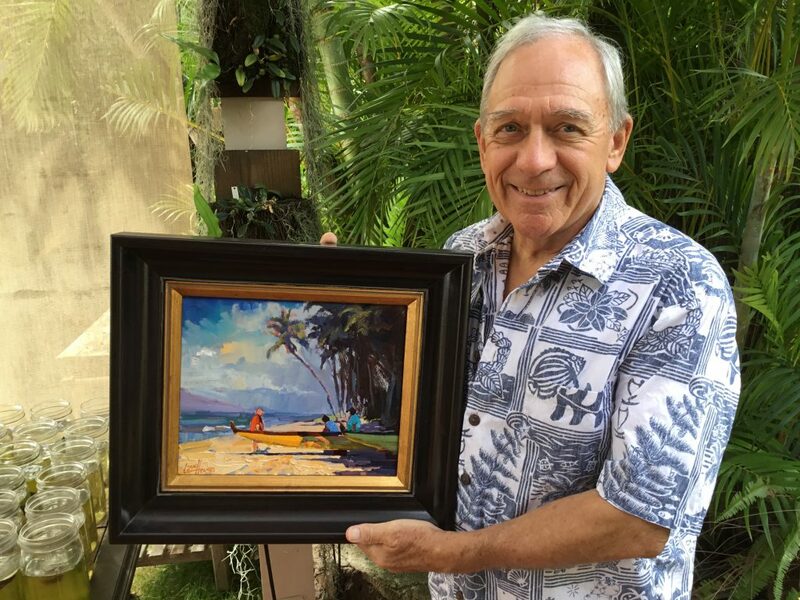 Sponsoring three public Maui Plein Air “Paint Outs” during Presidents’ Week are Pioneer Inn at Lahaina Harbor, Royal Lahaina Resort and Maui Nō Ka ʻOi Magazine at Kāʻanapali Beach and Montage at Kapalua Bay. For Maui students grades 3-12, Honu and Fridaʻs Restaurants sponsors a free painting workshop on Feb.17. The next evening, Feb. 18, Pioneer Inn hosts a free college-level art appreciation lecture by renowned art curator Jean Stern. Stern is the Associate Director of The Irvine Museum Collection and California Art Institute of University of California, Irvine. Maui Arts League also pays tuition for two high school art students to participate a three-day adult painting workshop taught by plein air professionals Suzie Baker or Josh Clare. 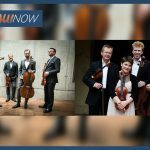 Later in the Spring, Maui Arts League will award cash scholarships to two Maui graduates planning to study fine arts. During the Awards Exhibition and Art Sale, Feb. 23 -24 at the Royal Lahaina Resort ballroom, Art Marketing professional Kim von Tempsky will moderate an artist panel discussion, and art educator Rae Takemoto will lead a discussion about the future West Maui Fine Art Museum. New this February are ticketed “collector parties” before every art exhibition and sale, with the opportunity to break bread with artists and early entrée to the sale. 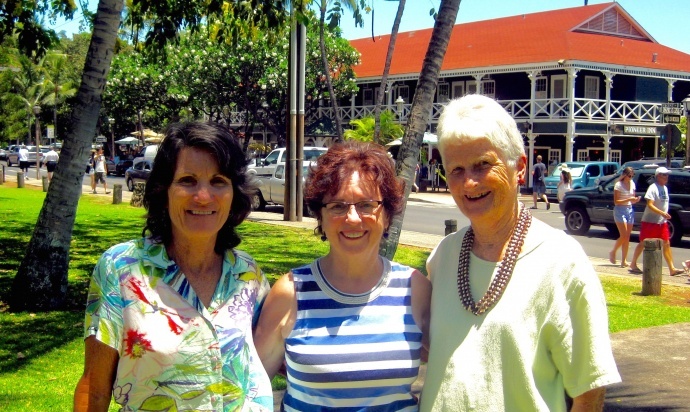 Feb. 23, art lovers can “Take an Artist to Breakfast,” at a special Royal Lahaina Resort buffet. Maui Plein Air artists receive a full commission on sales of their paintings, and another portion of the sale price supports Maui Arts League’s mission to showcase, cultivate, and build appreciation for visual fine arts while creating unique opportunities for people of all ages, cultures, and backgrounds to embrace the experience of fine art. 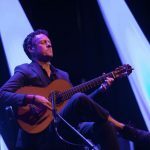 For details on collectors’ parties, weeklong event passes, tables for the Awards Gala and a full schedule of all public events visit www.CelebrateArtOnMaui.org or Call Lois Reiswig: 665-1491 to set up a sponsorship package or to volunteer services. Local educator and artist Ed Batholomew said Man in Boat by Leon Holmes grabbed him. Photo Courtesy of Maui Arts League. 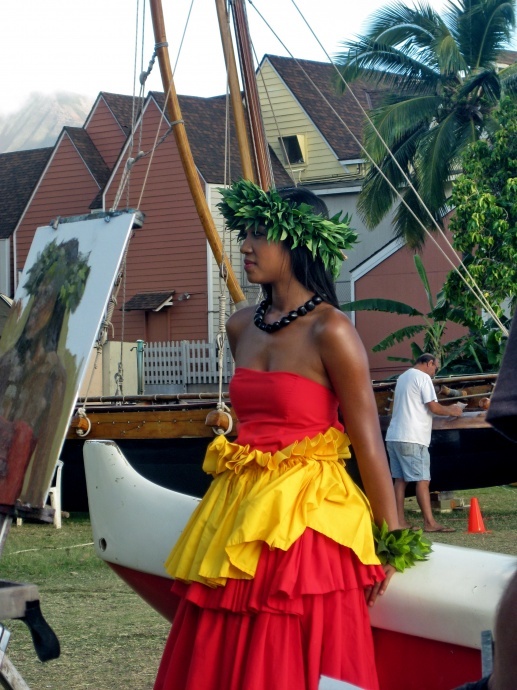 Plein Air Pinting of Puʻunēnē by Mike Carroll. Photo Courtesy of Maui Arts League. 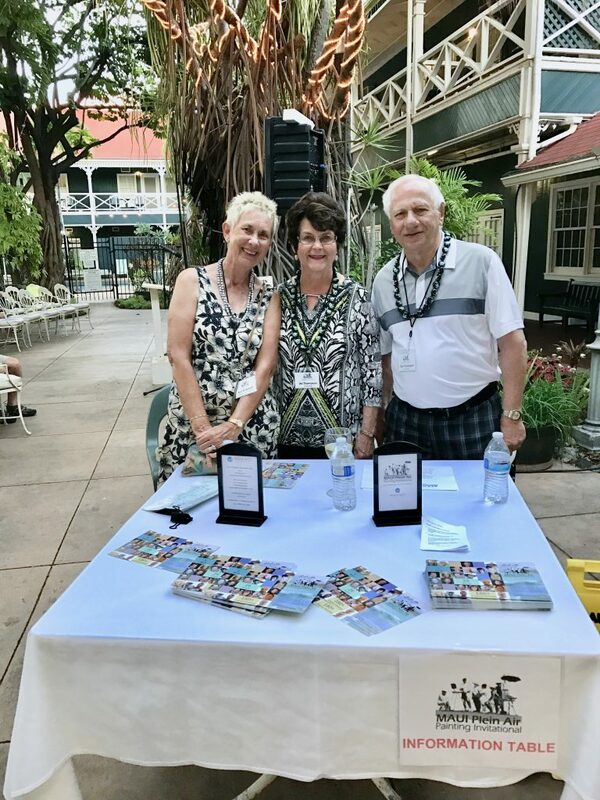 Maui Plein Air volunteers Ann Ahlbrecht and Ali and Tom Thompson greeting attendees at the Pioneer Inn Art Lecture. Photo Courtesy of Maui Arts League. 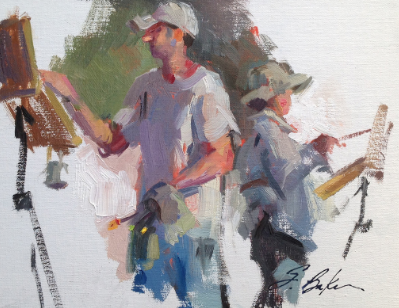 Plein Air Painters portrait by Suzy Baker. Photo Courtesy of Maui Arts League. 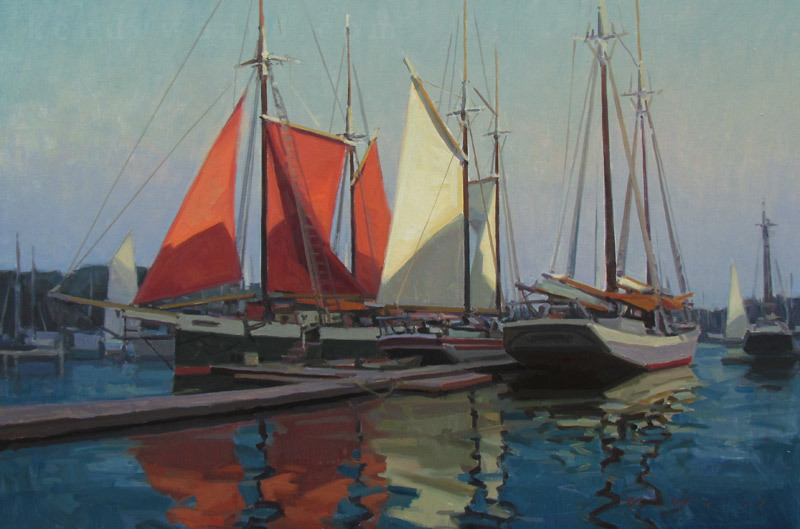 His marine painting, “Evening Light On The Sails” earned Ken DeWaard of Main e an invitation to the 2019 Maui Plein Air event. Photo Courtesy of Maui Arts League. First-time collectors celebrate with artist Leon Holmes copy. Photo Courtesy of Maui Arts League.